Winnipeg Rowing Club member and FISA Umpire Sandra Kirby has been selected to Jury at the 2009 World Rowing Under 23 Championships in Racice, Czech Republic which run from July 23 – 26th. While in the Czech Republic, Sandi will attend the FISA Umpire Clinic which is a requirement for FISA umpires every 4 years. After the U23 Worlds, Sandi will head to PEI to be on the Jury for rowing at the Canada Games. As a FISAumpire, Sandi completed a year-long training program including a in-depth study of the FISA Rules and Bye-laws, mentorship by a FISA umpire, passing an arduous one-day test at the site of a FISA regatta, and re-certifying at least every four years. At this time, there are approximately 15 FISA umpires in Canada, 2 of those in Manitoba (Don Hornby and Sandra Kirby). 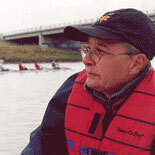 Sandi is a long-time rower and raced the Womens Quad at the 1976 Olympics in Montreal. If anyone is interested in umpiring, the first step is to complete the Rowing Canada Aviron (RCA) clinic, learn the RCA Rules of Racing, and ‘apprentice umpires’ for 2 racing seasons. You can contact us at rowwrc@mts.net for more information about the program.